Antioxidants are the powerhouses that fight free radicals in the body. Free radicals damage cells in a variety of ways and lead to decreased ability to fight disease or illness. Antioxidants support your cells to make them healthy and better able to defend themselves. Whole organic foods are the best sources of antioxidants. Vitamins E, A, C, zinc and selenium, as well as essential fatty acids are key to building immune system strength. Broccoli, brussels sprouts, carrots, leafy greens, raw nuts (almond, brazil nut, hazelnut), sunflower seeds, pumpkin seeds, sweet peppers (red, yellow, orange) and tomatoes are all great sources of antioxidants. Sprouted grains also give nutrients to the body that are needed to produce antioxidant enzymes, which again help to remove free radicals. Your immune system is greatly impacted by your gut health. If you experience infrequent bowel movements, fatigue after eating or digestive discomfort you may be having some issues with your gut health. This affects your immunity because the absorption of nutrients and antioxidants happens primarily in your intestines. If your gut isn’t functioning properly it can’t absorb nutrients or expel toxins, which leads to a build-up of bad bacteria and more disease causing free radicals. Antimicrobial agents such as oil of oregano, garlic, lemon, ginger, raw honey and onion help to kill bad bacteria; while probiotics help to provide good bacteria to the gut to aid in the absorption of nutrients. 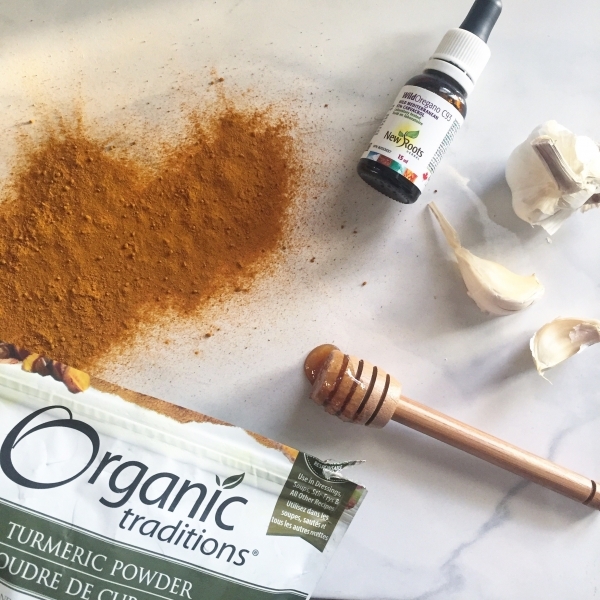 Turmeric is an anti-inflammatory (among many other benefits) that helps with respiratory viruses and also aids in bloating and gas. Stress is the absolute worst thing for your body and lends itself to a whole host of issues like heart disease, fatigue, weight gain and sets you up to get sick! When you are under stress your body releases cortisol to activate its “flight or fight” reaction. Prolonged stress over an extended period of time will increase your blood sugar levels, which can lead to bone density loss, memory loss, inflammation in the arteries, insulin resistance and it suppresses your body’s immune system making it harder to fight infection and disease. Supporting the adrenals and nervous system with vitamin B is a great way to combat the negative effects that stress has on the body. Vitamin B is found is dark leafy vegetables (like kale or spinach), avocados and whole grains. Not only a great stress reliever, exercise also increases blood flow and oxygen in the body. This allows for improved bodily functions, including, bowel movements, digestion, liver function and respiratory function. A properly functioning body be better at absorbing nutrients and fighting off infection. Exercise also helps block the effects of cortisol by using the excess glucose in the bloodstream, thereby reducing the effects of stress and cortisol on the body. Pilates in particular is very effective in relieving both mental stress and in promoting strength and mobility, while indoor rowing will have oxygen filled blood pumping in no time. One of the best ways to reduce free radicals and increase antioxidants in the body is to reduce the amount of exposure to toxins we are receiving. There are many ways to reduce exposure such as increasing your intake of filtered water, choosing organic when possible, reducing caffeine and alcohol intake, consuming antibiotic-free meats and limiting the amount of processed foods in your diet.